701 Third Street N. W.
Located in the oldest synagogue built in Washington in 1876, the museum depicts the history of the Washington Jewish community. We are the only organization in the Greater Washington, D.C. area dedicated to collecting, preserving and presenting the history of the local Jewish community. The museum is housed in the original Adas Israel Synagogue, the oldest synagogue in Washington, D.C. Dedicated in 1876 and used by the congregation until 1907, the building is now used for changing exhibits, educational programs for children and families and public lectures. Groups may arrange for special tours with a trained docent. Docents can gear their tour to meet your group's particular interest. Our archives contains organizational records, as well as business and family papers. We house a wonderful collection of photographs, scrapbooks, textiles and ritual objects. All of our collections shed light on the history of the Jewish community in Washington, DC and the surrounding suburbs. Sunday-Thursday 10:00 a.m. to 4:00 p.m. Admission is free, but a $2.00 donation from non-members is very much appreciated. We are located at the corner of 3rd and G streets, NW and we are easily accessible by the Metrorail system. The Museum - the historic Adas Israel Synagogue. As a beautiful artist's expression. The synagogue was dedicated in 1876 and used by ht e Congregation until 1907. 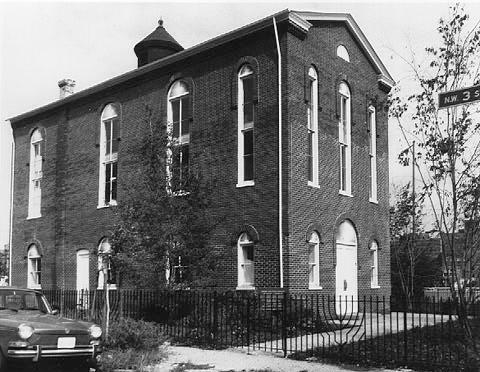 In 1969, the Jewish Historical Society of Greater Washington saved the building from demolition. Since 1974, it has housed the Lillian and albert Small Jewish Museum. Today, with some remnants of today's traffic. Sisterhood's Red Cross volunteers, World War I. Courtesy of the Washington Hebrew Congregation. Our current exhibit: Tzedakah: Jewish Women Creating a Capital Community, 1895-1948. First Anniversary luncheon, 1939. Jewish Historical Society Collection. If you wish to return to the Museums Tour Homepage.